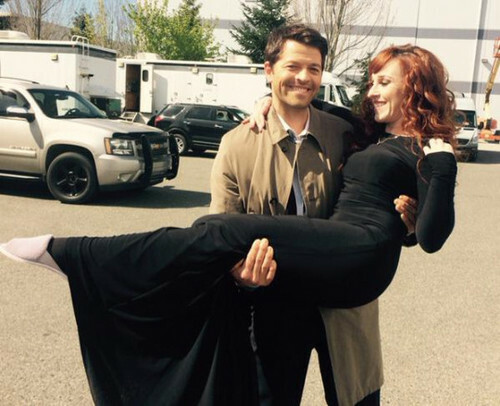 Misha Collins and Ruth Connell. . Wallpaper and background images in the Supernatural club tagged: photo supernatural season 10 ruth connell misha collins castiel rowena. This Supernatural photo contains business suit, mahusay bihis tao, suit, pantalon suit, and pantsuit. There might also be suit, suit ng mga damit, matumal suit, kalye, lungsod tanawin, and urban na setting.